Title: A Hot Time On The Old World! 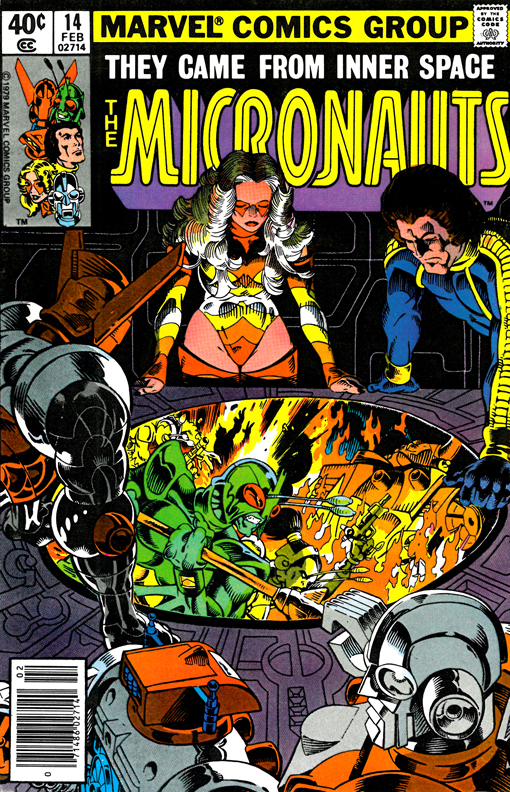 Synopsis: Continued directly from Micronauts #13. On his home world of Kaliklak, Bug and his gang mount an assault on the Colonial Air Terminus in an attempt to overthrow Baron Karza's remaining forces. They overpower their opponents, commandeering a fleet of airships and launching an attack on the Colonial Governor's headquarters in the Nest. Back on Homeworld, Biotron, Commander Rann and Marionette say their goodbyes to Argon and Slug, departing on Endeavor for new adventures in the Microverse. On planet Spartak, Acroyear decides that he is a warrior not a ruler and wishes to rejoin the Micronauts. A brief interlude follows as Time Traveler witnesses events on Earth that may threaten the Microverse: Agent M flies to the Baxter Building to reveal the existence of the Micronauts to the Fantastic Four. Back on Kaliklak, Bug's forces mount an attack on the Nest, taking the occupying forces by surprise. Bug's father tries to shoot down his son in order to take back control of his gang, but he is shot down an enemy cannon. Bug and his forces seize the palace and blast the Colonial Governor unconscious, winning the battle and their freedom! The issue ends with Acroyear and Cilcia joining the Micronauts on Endeavor, the team learning that Bug is alive and setting a course to Kalilkak. Next issue the Micronauts meet the Fantastic Four!